Nevertheless, Architecture II or The Man from Potin, as the work is also called, like The Lady in Mauve — perhaps intended as its companion piece — falls outside the norm because it is not a perspective view and because of the importance accorded to the human figures in the architectural composition. It was clear to Hans Hess, the painter’s first biographer, that both paintings were based on his memories of the streets of Paris. 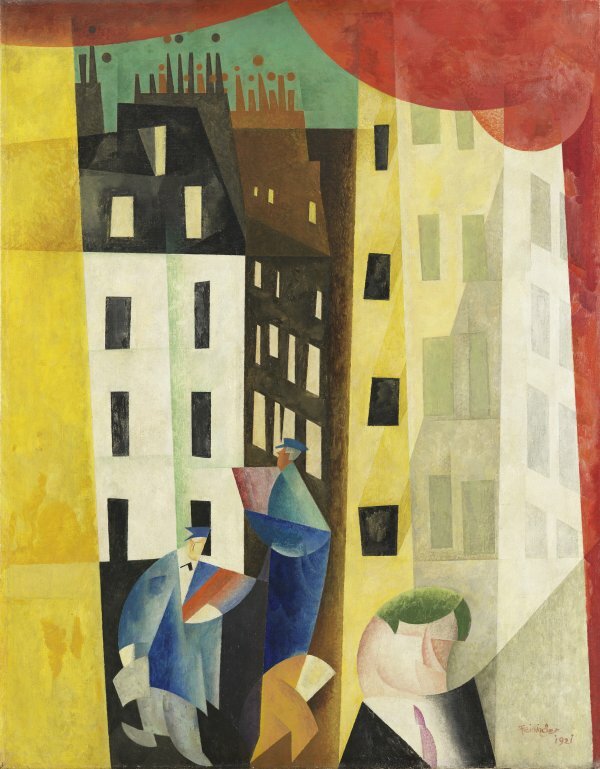 According to T. Lux Feininger, who inherited the painting when his father died, the title of The Man from Potin refers to a delivery man employed by the famous grocery shop in the French capital. In the present painting the artist shuns the typical crystalline forms of the period and is chiefly concerned with establishing colour contrasts. The curving volumes of the three foreground figures contrast with the geometrical forms of the buildings. The urban image of buildings deconstructed into multiple planes has the appearance of stage scenery. This impression is accentuated by the red curtain on the right side, which Peter Vergo has related to the sets for Robert Wiene’s film The Cabinet of Doctor Caligari, which premiered in 1919.